I thought that rather than share a whole bunch of images in one blog post, I would select individual images and tell the full story behind them including how I went about setting the image up, including the camera settings, ultimately capturing the final image and any post processing that I've carried out. 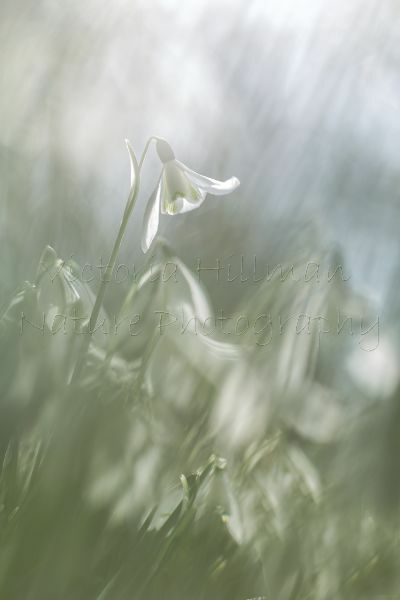 I've decided to start with snowdrops as they are one of my favourite flowers to photograph and one of the first flowers we see at the start of the year. Snowdrops are the one flower that I really look forward to photographing above all others but it can be tricky to know where to begin. Whether you have one small clump or a whole woodland carpet, each have their difficulties getting started, do you try and isolate just one single flower, what about picking out one snowdrop but using the rest as a foreground and background, or do you go for a wide landscape type shot? Well, there are so many possibilities and you'd be surprised how many more ideas come to you once you get stuck in to taking some photos. There are a couple of places fairly local to me in Frome, Somerset, UK, that have two very different displays of snowdrops, one is a small patch of snowdrops next to a river and the other is a huge woodland glade. I use local patches as it means I can visit them again and again to photograph the snowdrops in different light conditions and also with different ideas of what I would like to come away with building on the previous visits. I photograph snowdrops a lot, in fact I spend weeks at the beginning of the year just photographing them and nothing else, so picking one image is really quite a difficult task, but I have chosen "Painted Snowdrops" as for me it was one of the more technical images that took setting up and time to get just right. This image was taken in the woodland glade just over an hour from my house and I had been looking for a single snowdrop that was standing above the carpet of snowdrops and after much searching I found the perfect little flower and they were on a very slight slope which was very useful for the final composition. The afternoon dappled light coming through the trees was just perfect and it was time to tackle the composition, I knew I wanted a soft painted feel to the image so set about finding the right angle shooting through the snowdrops in the foreground and using a wide aperture of f/2.8 to just have the single flower in focus using single-point auto focus. Using a wide aperture and shooting through the snowdrops I was able to create a soft and painted feel to both the foreground and the background with the out of focus trees in the distance adding to the effect. It took several test shots to get exactly the image I was looking for, by looking at each shot after I'd taken it allowed me to make any necessary positional, lighting and camera setting adjustments that were needed to achieve the final shot. In the end I actually dropped the ISO to 100 and slowed the shutter speed resulting in a slight blur of all the out of focus snowdrops as the breeze kept them gently moving but keeping my main flower in focus. In terms of post processing, I actually keep it to a minimum doing just minor adjustments to further enhance the image I've so painstakingly taken time over creating in camera in the field. So for Painted Snowdrops, I increased the clarity, made minor adjustments to the blue and green colour calibrations and darkened the shadows a little for the final image which you see here. For me it is about capturing the image in camera not on the computer, and an image such as this one can easily take over half an hour to perfect. I hope you've found it interesting finding out about what work goes into creating this particular image and for many of my images it is a similar work flow.